Prance is what horses do when they move with springing steps. It also means ‘to ride on a horse doing this.’ By extension, if a person prances, it means that he or she walks in a really proud manner, with exaggerated steps, trying to attract attention. As a noun, a prance is the act of prancing. The horse pranced across the field. The riders pranced through the park. Lydia pranced into the room. George's step had a spring to it; you could almost call it a prance. Prance dates back to the mid to late 14th century. 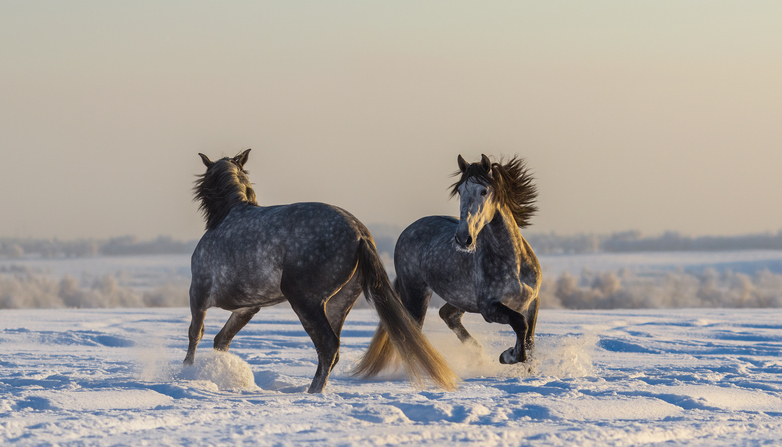 The Middle English verb prauncen or praunsen was originally just used to describe the spirited walk of horses, though the sense soon expanded to any spirited type of gait, and then figuratively, meaning ‘to show off.’ Its origin is unknown, but some linguists think it emerged as a variant of the Middle English verb pranken (‘to adorn or arrange your attire’ or ‘to show off’), which probably came into English from the Middle Dutch verb pronken or proncken (‘to show off’ or ‘flaunt’), and can be traced back to the Proto-Germanic prangana or prangijana, from the root prag (‘to press’ or ‘squeeze’), and further back to the Proto-Indo-European root bhrang– (‘to press’ or ‘squeeze’). It is related to the Middle Low German prunken and the German prunken (‘to flaunt’) and the Danish prunke (‘to make a show or prank’), as well as the German prangen (‘to make a show’), the Dutch prangen (‘to squeeze’ or ‘press’) and the Danish pragt (‘pomp’ or ‘splendor’), Another theory is that it came into English from the Danish dialectal adjective pransk, which means ‘spirited,’ and was often used to describe horses, or verb prandse (‘to go in a stately manner’). One final possibility is that it came from the Old French verb paravancier.